Ask anyone what they know about Mount Isa and the main answer you would get would be mining. 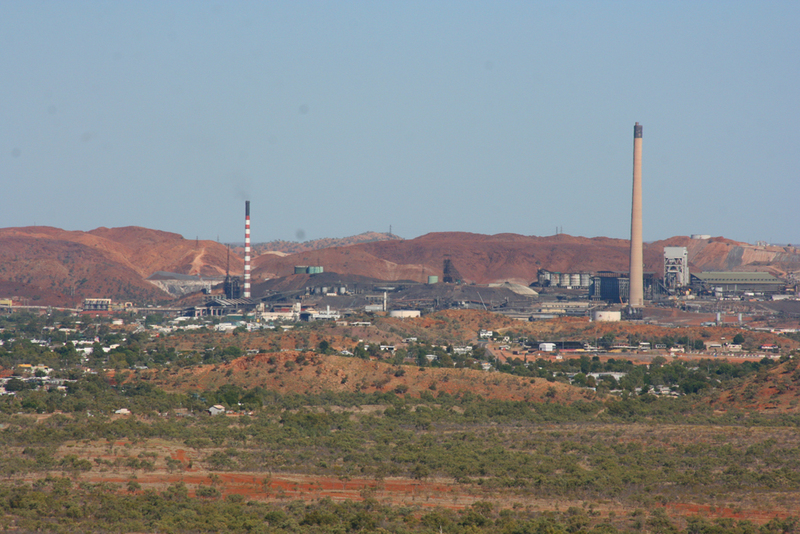 Mount Isa Mines is the main employer in the town. 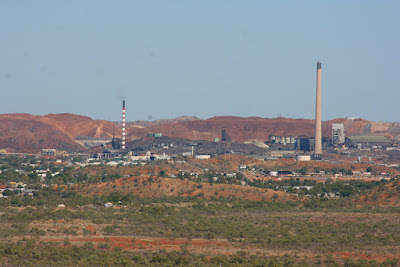 Mount Isa Mines is one of the biggest mining operations in Australia. The main material mined is copper and zinc, with the largest zinc resourse base and the biggest underground network of mines in the world. At the moment there is a bit of a slump in the mining industry due to the stock market, but prior to the downturn they had almost 4,000 employees. I have visited a number of mining towns around Australia but Mount Isa has a different feel about it. It's not just mining there is a lot of other infrastructure in the city. Today we decided to do a bit of touristy stuff. One attraction you can do it an underground mine tour at Hard Times Mine. It's supposed to be really good but seeing Shane has worked in an underground mine and I have toured in a working mine we decided we didn't need to do the tour. 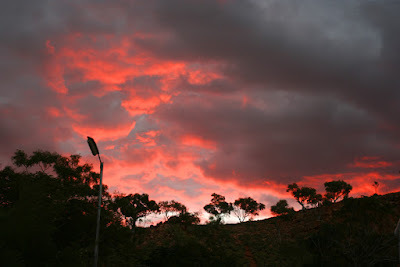 The manager of the caravan park told us about a lookout that not many people know about so that was our first destination, and we certainly weren't disappointed. The 360o views were amazing. 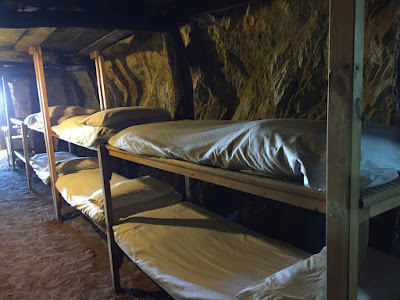 Then it was off to the Underground Hospital, Tent House and Beth Anderson Museum. 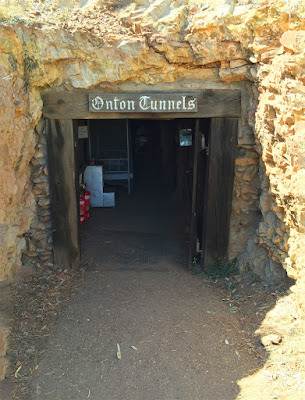 The Underground Hospital was built in 1942 following the bombing of Darwin in February of that year, resulting in heavy casualties. It was feared Mount Isa could be their next target due to the location of such a big mine. 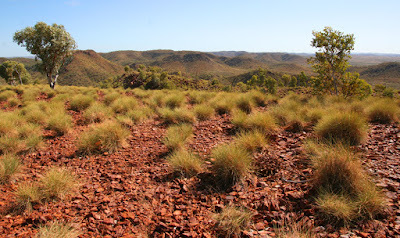 With this event Mount Isa Hospital Board decided to excavate the hills behind the existing hospital for an underground hospital to care for patients and handle casualties in the event of a raid. The hospital was finished in a manner of weeks with surgical, medical and maternity facilities. Luckily the raids never eventuated but it did provide a place for a cool and quiet sleep for nurses on night shift. 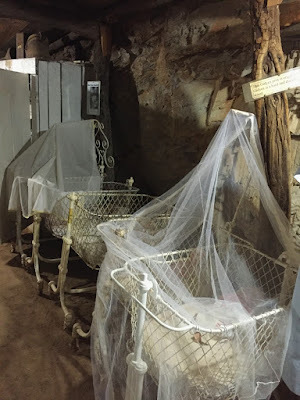 After many years of disrepair in 1977 the underground hospital was rediscovered and is now a very popular place for us tourists to visit. Our adventure ended with a visit and a picnic at Lake Moondarra which is Mount Isa's main water supply. 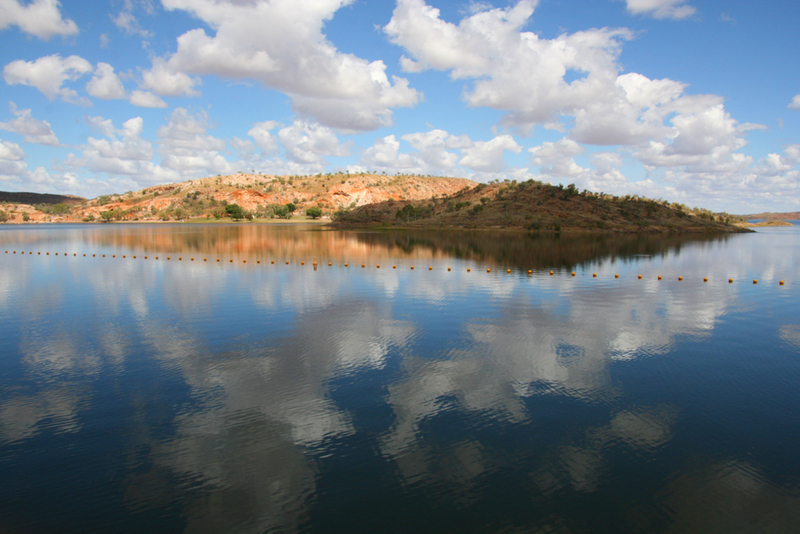 It is a bit weird driving up and seeing such a large body of water out here in the outback. The lake was dammed back in 1950's as there was a great demand for a water supply. 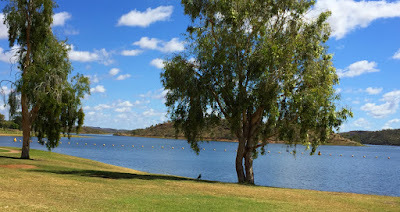 The lake now is also a place for many water activities and quiet a pretty place to sit and enjoy. While eating lunch we had a visit from 3 very friendly peacocks. 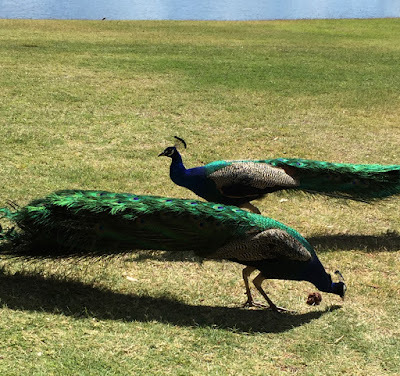 My they make a lot of noise, just like a trumpet.